Seaside, CA (March 25, 2015) – Annalisa Mitchell and Sun Street Centers has been selected as one of the five recipients in the United States for the Excellence in Supervision Award (ESA) by Breining Institute. 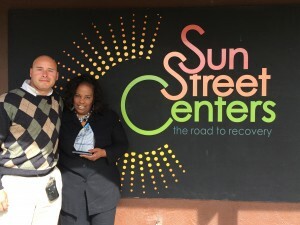 This is presented with a $1,000 award to Sun Street Centers, a personalized acrylic award with Annalisa Mitchell and Sun Street Centers named on the award, as well as recognition on Breining Institute web site. Annalisa just celebrated 7 years of employment at Sun Street Centers as a stellar Driving Under the Influence (DUI) Educator and Counselor. Sun Street Centers has served over 12,500 Monterey Residents with DUI convictions over the past 5 years. Since 1968, Sun Street Centers has been providing the most comprehensive and effective services for education, prevention and recovery of alcohol addiction and drug abuse throughout Monterey County. Relying on a proven social model developed by founders Martin and Nancy Dodd, as well as the compassion and experience of an expert staff, Sun Street Centers welcome all individuals and families to hope, heal, and thrive with a drug-free and alcohol-free lifestyle. For more information please visit sunstreetcenters.org.